Today I built a little device that will allow me to record a phone interview into my iRiver recorder. If you have heard my recent podcast, you know that the recording quality was not that great. I would still like to find a fix for that problem, which I will do…some day. But until then, I came across a neat solution on my own. I have a phone that allows you to tap in with a cell phone headphone/microphone combo. The kind with the tiny little plug. 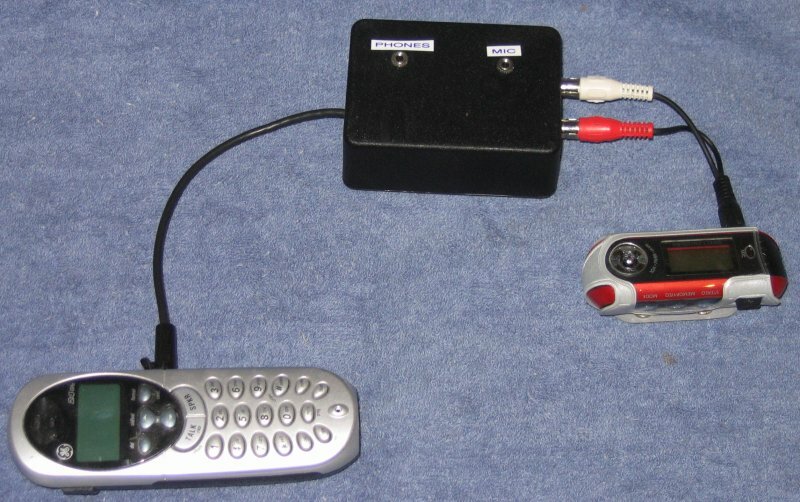 The box I built comes out of the phone and splits into separate connectors for an 1/8″ headphone and an 1/8″ microphone plug. Then the headphone pipes over to an RCA connecter and out to the iRiver’s microphone input. There is one other thing I need to figure out. Maybe one of my readers will have a suggestion. I want to record only the other person through the iRiver. Then I will record myself through my computer. This total isolation of the voices on the recording helps edit out interruptions on one end or the other. In my current setup, I get my voice coming into the recording. It is not nearly as strong as the person on the other end, but it is still present. I thought it was due to my headphone/microphone combination. But, I ended up plugging in a separate headphone and ran the mic out of my mixer back into the box so that the other person could hear me. I still had my voice in the recording. I assume this is due to the telephone patching my voice back through the speaker. That way the person on the phone hears their own voice and knows that the line is not dead. The biggest problem is that the call quality is phone quality. You will be able to hear in the recording that it is definitely a phone interview. This was done for episode 18 of Missionary Talks. I recently bought a recording box for my cellphone @ Radio Shack and a digital recorder similar to your setup. I was wondering, Is there a way to rig them to a board or something so that it would be more mobile w/ no wires all over the place? Previous Previous post: Great photos!